With this pattern you can make either a bracelet or an adjustable watchband. The instructions show you how to do an invisible join if you want a roll-on bracelet, or you can use the directions to make a bracelet with a clasp and toggle. Alternatively, you can use the pattern to make a watch band. Instructions include everything you need to make this adjustable watch. 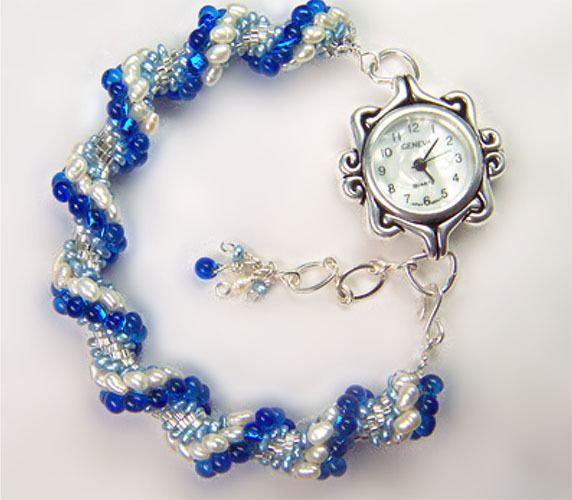 The pattern uses crystal silver-lined Delica beads, light blue seed pearls, white rice pearls and blue Miyuki drops, and a watch face of your choice. You need to know basic slip-stitch crochet, and simple wire-working techniques. Instructions include a source for the correct sized seed pearls.